Essex seamer Jamie Porter and fellow youngsters Callum Taylor and Tom Moore have signed contracts until 2016. 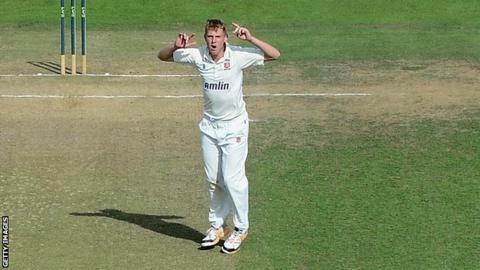 Porter, 21, and fast bowler Moore, 22, made their first-class debuts in 2014. Porter took figures of 3-26 in an innings victory over Leicestershire in September, while Moore has eight wickets from four games. All-rounder Taylor, 17, scored a half century in the Second XI Championship final against Leicestershire at Chelmsford in September. Head coach Paul Grayson said: "We are delighted with the progress all three are making and see them as an important part of our future. "It is something we are really committed to here at Essex, namely developing our youth players and giving them a chance to play first XI cricket."